Get the inside information on your Italian Vacation Planning. Great tips, inside information, travel advice and more! 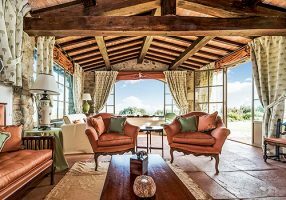 Tuscany is a place that inspires dreams, and there’s no better way to enjoy the landscape than staying in a villa with sweeping views of the Tuscan countryside. 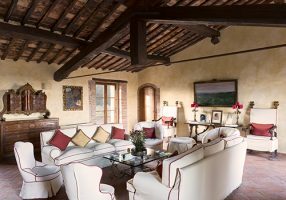 When we first visited the Brunello Vista villa set in Tuscany’s beautiful wine country, we knew this was the perfect place for our guests to relax and soak up that famous Tuscan sun. This remarkable 7 bedroom villa has a main house set on three levels with four bedrooms, a guest house with two bedrooms and a pool house with an additional bedroom. There’s also an infinity pool and plenty of terraces for relaxing and dining outdoors. The villa is absolutely picturesque with its rustic setting surrounded by marvelous views of vineyards, olive orchards and woods. Inside you’ll find a stunning interior that has been completely remodeled to the highest standard and beautifully decorated with designer’s eye for the little touches. Each one of the rooms has been thoughtfully appointed with care for the guest’s comfort. Highest quality designer linens, luxury toiletries, luggage racks (which impressively match the decor of each room), and beautiful antiques fill this home. You’ll love exploring all the rooms with their unique style and lovely views. The setting of Brunello Vista couldn’t be better. It takes it’s name from the famous Brunello di Montalcino red wine produced nearby. In fact, the views from this villa face toward the town of Montalcino in the distance. This is Tuscany’s wine country and is home to super Tuscan red wines. Spend time exploring the area or enjoy an easy drive of only about a half hour to Siena. The Brunello Vista villa sits atop a gentle hill surrounded by 25 acres of countryside with views of a patchwork of farms, vineyards, estates and wineries. In essence everything that makes Tuscany so appealing! Pour of glass of Brunello di Montalcino and sit back on the terrace or relax by the pool while savoring the views you’ve always dreamed of seeing in Tuscany. At the Brunello Vista you’ll enjoy a wonderful stay where luxury and good taste are the hallmarks of gracious hospitality. Contact us to book your 2018 stay at this gorgeous Tuscany villa! Where to Go and What to do in Italy? Where to Stay in Rome? Italy Perfect Experts Share Advice. Spectacular Vacation Villas Right in the Center of Rome!